Our attorneys and staff work personally with our clients. We all take the time to get to know you and understand your needs and concerns. 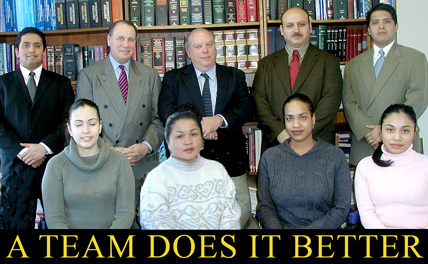 Your needs are handled by a team of highly professional, multi-lingual attorneys, paralegals and clerks. They have experience working with the State and Federal Labor departments, the Immigration and Naturalization Service, the US Department of State and all local, state and federal courts. We have developed an extensive knowledge of the processes and procedures which make it possible to for us to achieve the best possible results for you in the shortest possible time, regardless of how demanding your case might be. Many law firms are large, impersonal and remote. Ours is different. You can call or visit, and speak directly with your lawyer or paralegal. As a team, we represent small and mid-sized companies as well as individuals undergoing the U.S. immigration process. Our practice is exclusively in the area of U.S. immigration law. Our office works to provide employers and employees with the latest and the most appropriate immigration strategies. We keep pace with rapidly changing immigration laws and growing client expectations by locating ourselves at the constantly expanding frontier of immigration laws and integrating technology in our daily operations. Our Law Firm utilizes advanced office technology for document creation, client case management, communication and internal coordination. This allows us to successfully manage client case work from a brief, simple process to a long-term, complex case. To serve our clients in an efficient manner, our Office is comprised of a team of staff, all led by experienced attorneys. The departments operate under coordinating talented paralegals. We take personal pride in the quality of our work and our attention to detail. The satisfaction of the client is paramount. We strive to provide each client with successful results by considering all appropriate and creative options. Looking for prompt legal representation? Contact our office. We will evaluate your situation and tell you what can be done, what it will cost, and how long we think it might take. Remember that each case is different, and your case requires unique treatment. Take the time to talk to us - let us explore all possible options together. We are eager to help you. Schedule a consultation today.